Eight different men each paid more than $2,500 for slots in Tuesday's Mount Marathon race — an hour's worth of suffering that some people would likely pay that much to avoid. Organizers sold the bibs — 10 for men, 10 for women — at a Monday night auction at Seward High School, where the women's entries went for far less. Men's prices didn't hit the sky-high $4,500 that topped last year's auction. But race veterans and organizers said they thought the total amount of cash raised at Monday night's auction — about $30,000 — was the most ever. So, what kind of person spends thousands of dollars for the privilege of running — or slogging — up and down a mountain? "A guy with a sponsor," quipped Patrick Stinson, 37. "My dad." Stinson's father initially offered $1,000 to help his son buy a bib, but the bids kept going up and up. "He was like, 'Do it. Do it.' I'm like, 'I don't know, it's my dad, I don't know what to do!' " said Stinson, who ultimately got his bib for $3,000. 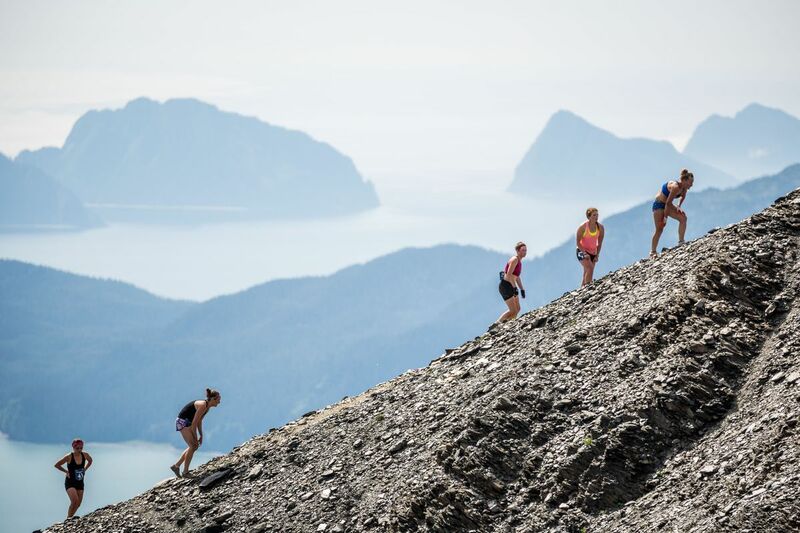 The Seward Chamber of Commerce organizes the Mount Marathon race, the iconic, century-old event that runs up and down 3,000 vertical feet and attracts thousands of spectators to the seaside town each July 4. Unlike most other running races, you can't simply buy a slot — most of the 350 entries in the men's and women's events go to last year's finishers, while others go to elite mountain runners and winners of a lottery that closes months before Independence Day. That means that by the evening before the race, there can still be dozens of people willing to pay hundreds or thousands of dollars for bibs. They gather for the auction with other race participants and spectators at the high school gymnasium; one additional slot is also raffled off. The auction originally started outside the Yukon Bar, where entries went for $75 or $100, said Steve Lemme, the longtime auctioneer. He went to auctioneering school in Iowa and ran Monday night's event in a cowboy hat and vest, with the gymnasium's muffled speaker rendering his drawl unintelligible except for dollar amounts. The women's bibs went first; half went for $500 apiece before bidding petered out on the last two, with the last one going for $200. Anna Dalton, who won last month's Twilight 12K in Anchorage, grabbed a slot for $500 and will race her first Mount Marathon on Tuesday. The men's bidding started out at a furious pace, with the first slot going for $3,100 and none selling for less than $2,700 until the ninth bib, which went for $1,400 to a 41-year-old Portland man, Steve Baer, who grew up in Michigan. Only at Mount Marathon does a $1,400 race entry equate to a bargain. But Baer's wife, a longtime friend of former race winner Holly Brooks, was stoked. Upon hearing that her husband got his bib for that much, she sent Brooks a text message: "Pays to be a Jewish accountant from Detroit."